Hello! 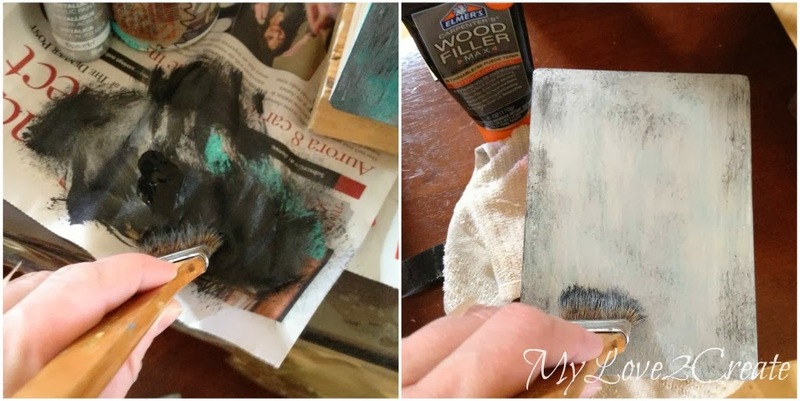 It is a beautiful Monday here in Colorado and I have a fun project to share! My faux metal upcycled shelf. It was one of my contributor posts at My Repurposed Life over a month ago. So fun! Here is a closer look at the shelf before. First off this shelf had been moved around so much that it was falling apart, so I helped it out a little and pryed off the side pieces. Then I cut off the curved ends with my miter saw, making them flush with the top and bottom boards. 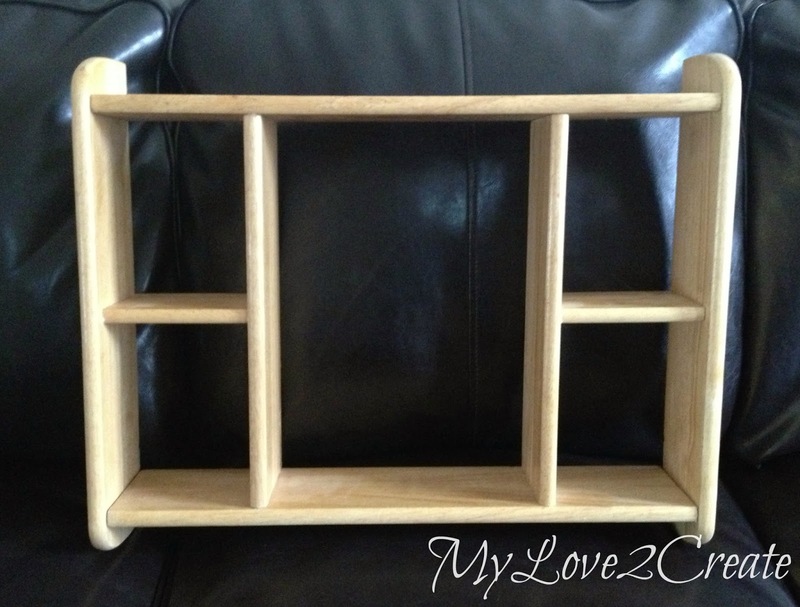 I wanted to make a middle shelf so I could have six drawers. I measured and cut one to size then used my Gorilla Wood glue and nail gun to secure it (top left photo). In the middle photo above you can see I glued in the two side dividers. Then I added more glued to then end pieces and put them back on. I went around with the nail gun to hold everything in place until the glue dried. This is what I ended up with. I was ready to make some drawers! Since I have a plethora of scraps left over from my master closet makeover, I was excited to use them for this project. 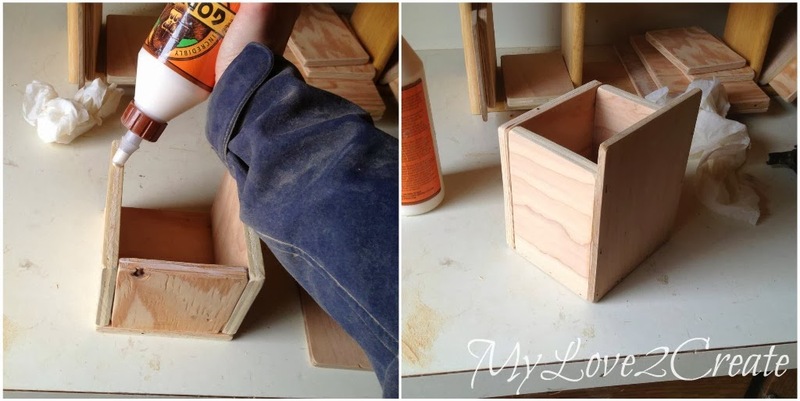 I set to work measuring, cutting, and sanding, so I had pieces to make a box for each cubby. Oops! I forgot to make drawer bottoms...dang! More measuring, cutting, and sanding...thank goodness only six this time! I kept the drawer pieces in each cubby that they were measured for, because not all cubbies are created equally. 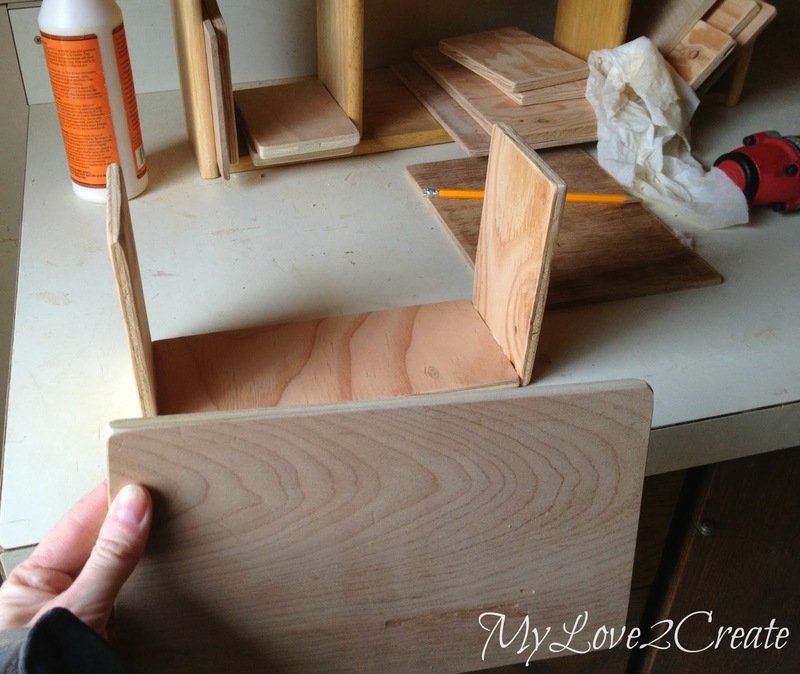 To build, I glue and nail the sides to the bottom, then I am ready for the back piece. 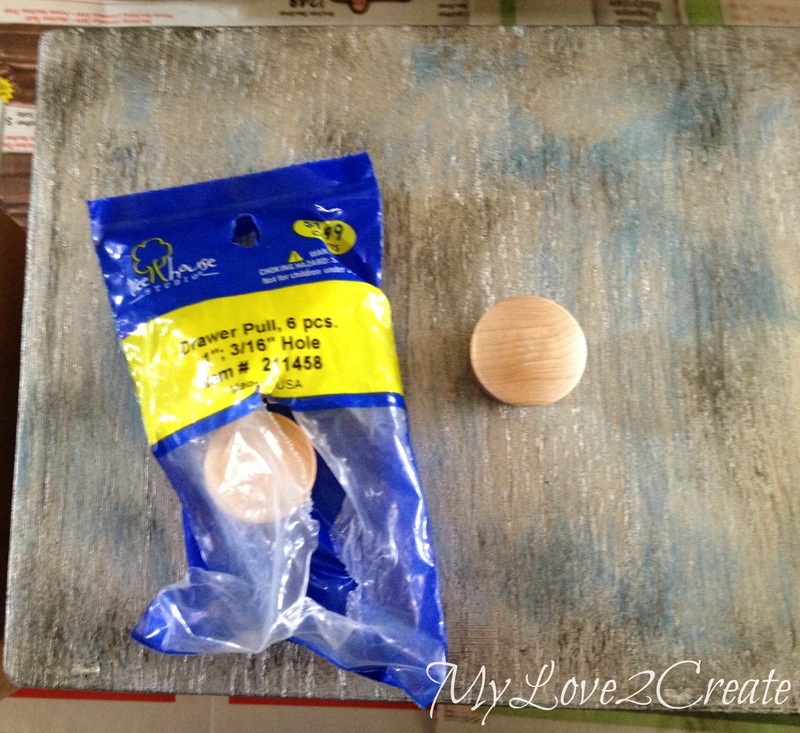 Glue is the trick, it is what keeps my boxes strong, the nails are just to hold it while the glue is drying. You can see my drawer or box all built with the front on. I used 1/4 wood for the fronts, these were scraps from my closet drawer bottoms. Gotta love those scraps! I thought it needed a little beefing up on the top, so I grabbed a scrap board. I let it over lap just a little then cut it, glued, and nailed it on. You can see also that I am trying out some old knobs as feet. I also did this on another project recently my DIY Corner Fruit Tower. 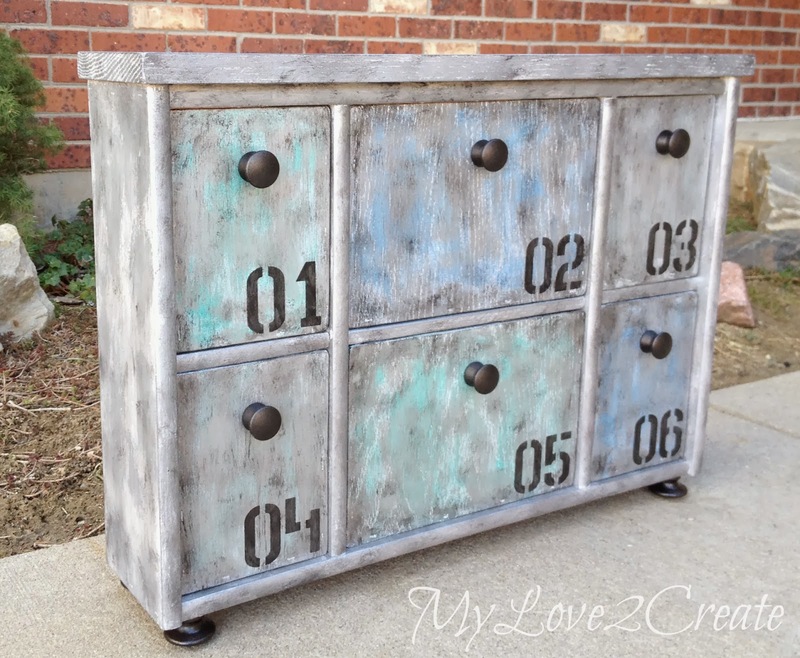 It is a great way to repurpose outdated knobs. Deciding how to paint a project is always the hardest part for me. 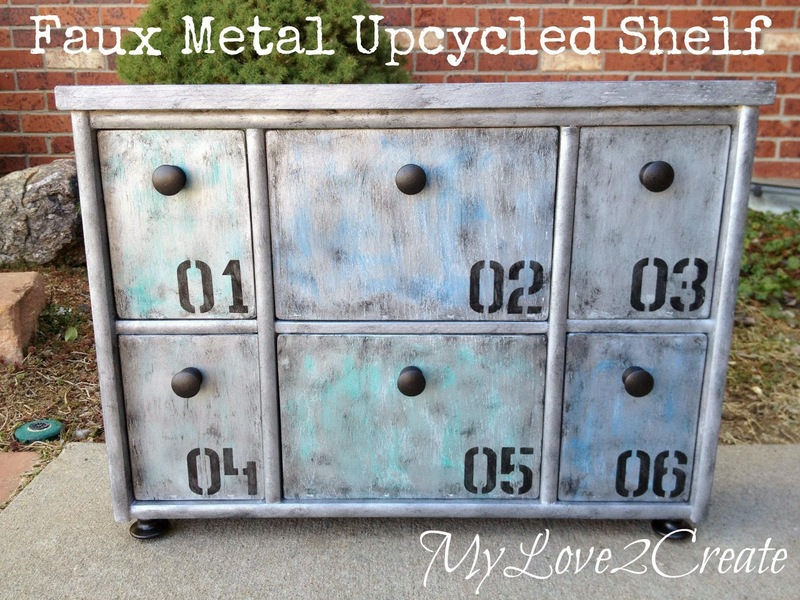 I have always loved the look of metal and really went out on a limb and tried the faux metal finish. I began with painting the drawer fronts white (top left photo) and I didn't make it a great paint job either as you can see on my first drawer. Then I slapped on some green, blue, and gray on different fronts. 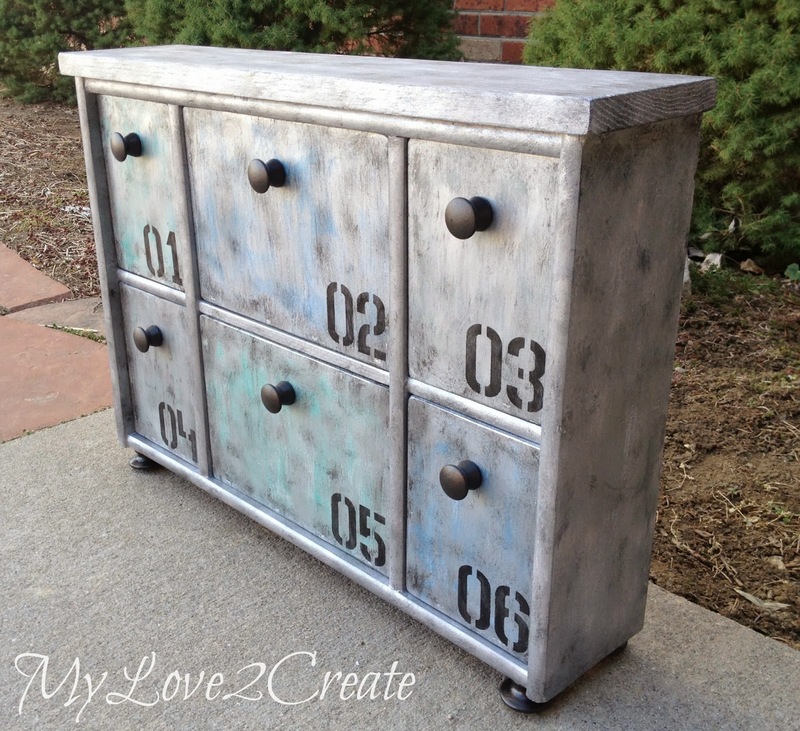 I used a metallic silver craft paint and painted it on pretty randomly. And finished off with some black accents. To do the black, I just got a little on my cheap brush and then rubbed most of it off before painting it on my drawer front. Again I was going for the random, not perfect look. For my shelf I did the same, but skipped the color. On the left you can see I brushed on some white, and on the right I did the metallic silver, and started with the black accents. I got these drawer pulls from Hobby Lobby and they are only $1.99, but with a coupon it was $1.20 something. 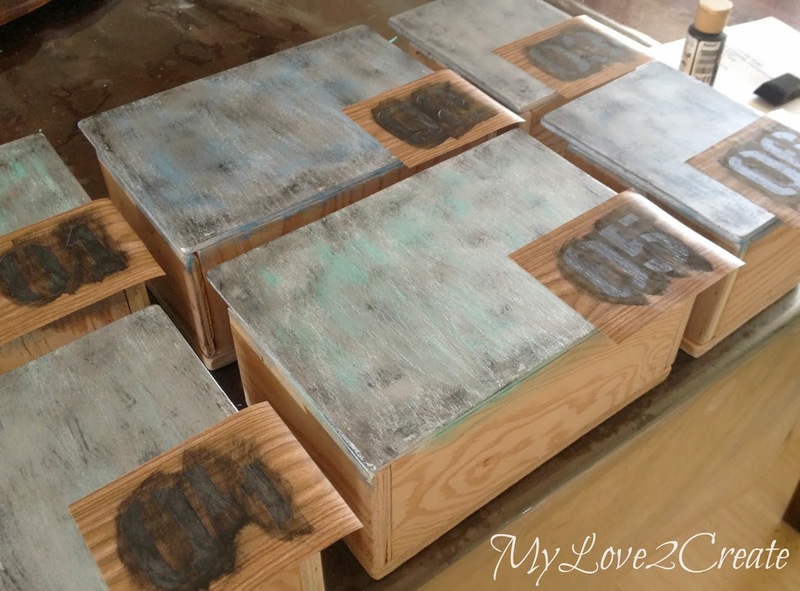 I spray painted them and the "feet" knobs with some oil rubbed bronze. 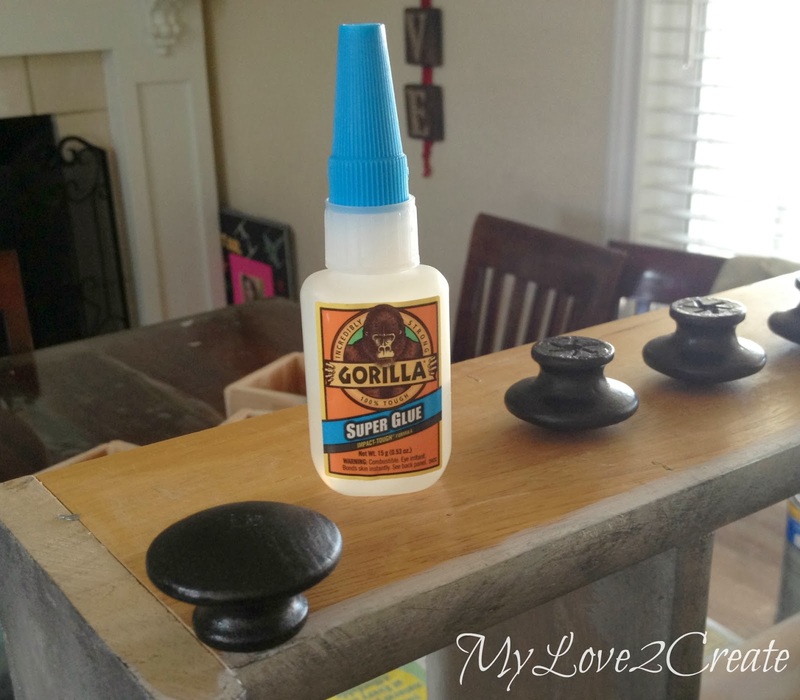 So you know I love the Gorilla wood glue, well I found a new love! Their super glue is AWESOME! Normally I hate superglue. I have only used it from tubes that as soon as you open it the glue comes out too fast and then you have super glue all over, and fingers stuck together. Or those hard bottles, that you can't even squeeze. 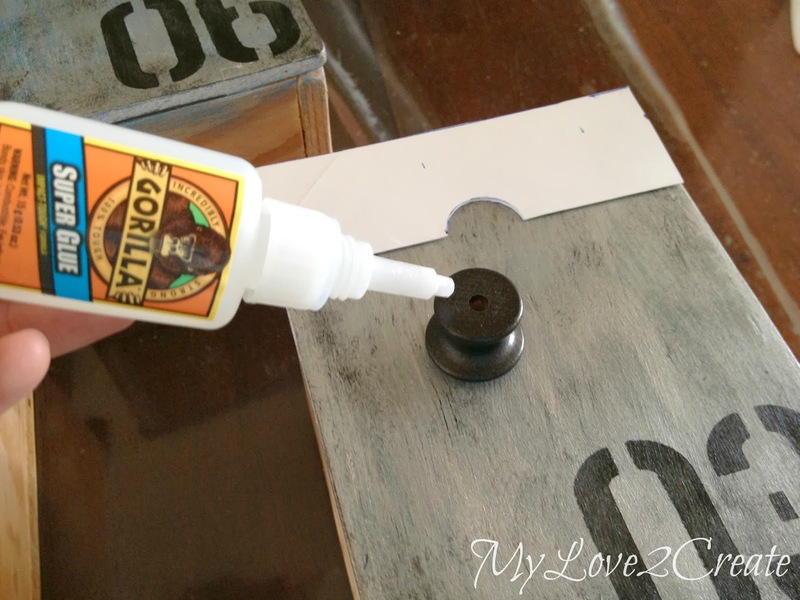 That was not the case with the Gorilla super glue! I had full control to squeeze out how much I wanted, and it didn't get all over! I used the tiniest drop and held it for thirty seconds. DONE, and it was stuck GOOD! I love it! I couldn't resist making number stencils on some contact paper. I used the same black to paint them on. If you are doing multiple drawer pulls, I suggest making a simple template out of paper. This one helped me place my knobs in the perfect spot. That is it! Now I have a super fun statement piece, that is very useful! I mean come on! 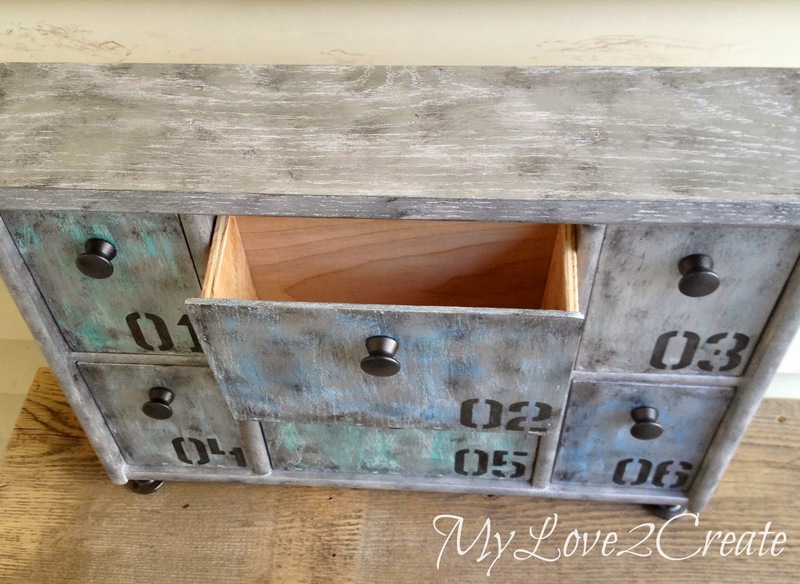 Six drawers to hide treasures in...that is what kids love! 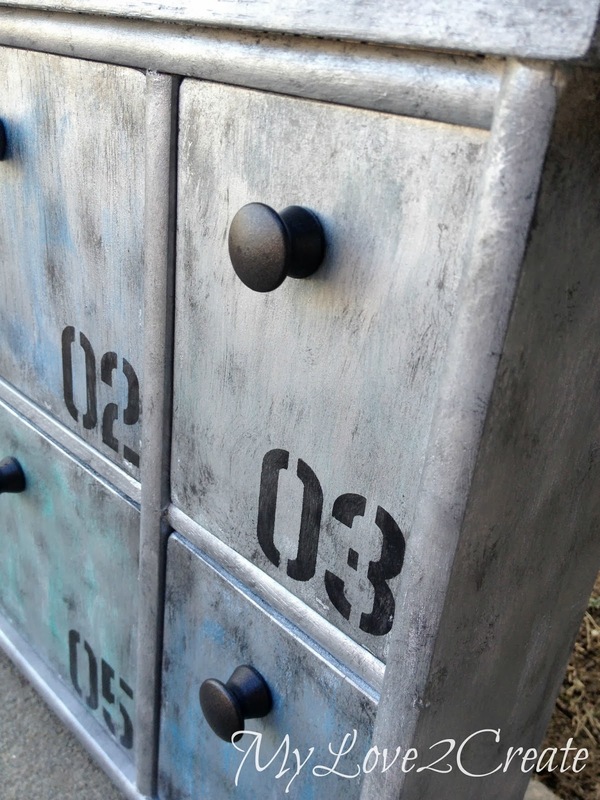 I am loving the faux metal finish, even if it isn't perfect it adds a fun touch of industrial. Could be as cool as this...? Makes you think twice about old, has beens. 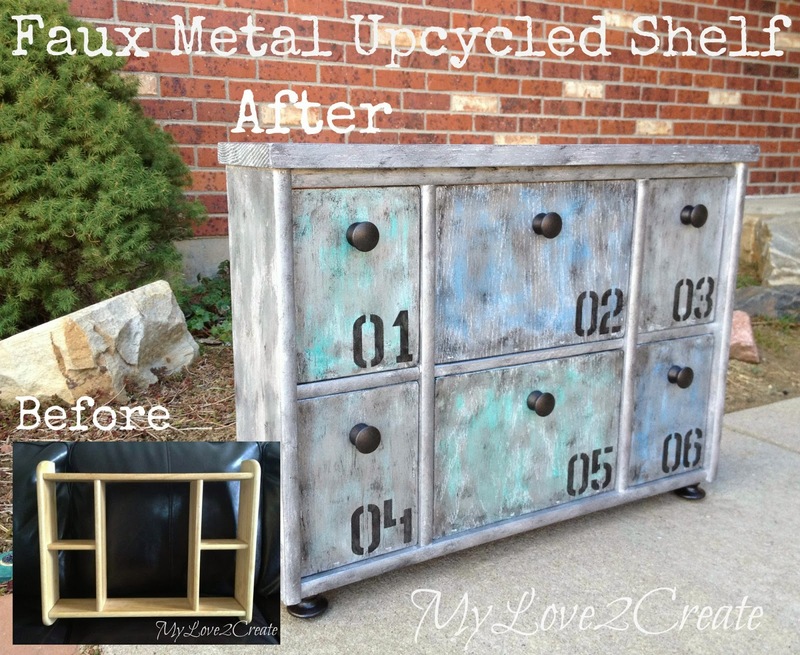 Is there anything you have upcycled lately? Oh, and one more thing...I had the chance to go to SNAP last week, a blogging conference, it was very cool and I must confess a little overwhelming, but I am so glad I went! I will have to share a few photos with you! 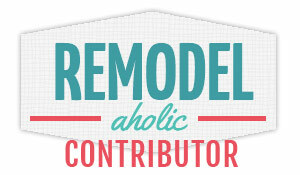 I will also be sharing how I made the shelves in my sister's closet/laundry room makeover later on this week. I had wanted to last week but getting out of town for a trip proved to be too much. To top it off, two days before I left we had to put our dog Buck down, he was the best dog ever! Talk about heartbreaking, he has been missed so much. Those first nights I spent lots of time comforting 6 sweet kids that eventually ended up crying themselves to sleep. Such hard life lessons! Amazing, as usual. Love the knobs for feet. Pinning. I love it! It's great to have this kind of storage in kids rooms, they have so many collections and knit knats! 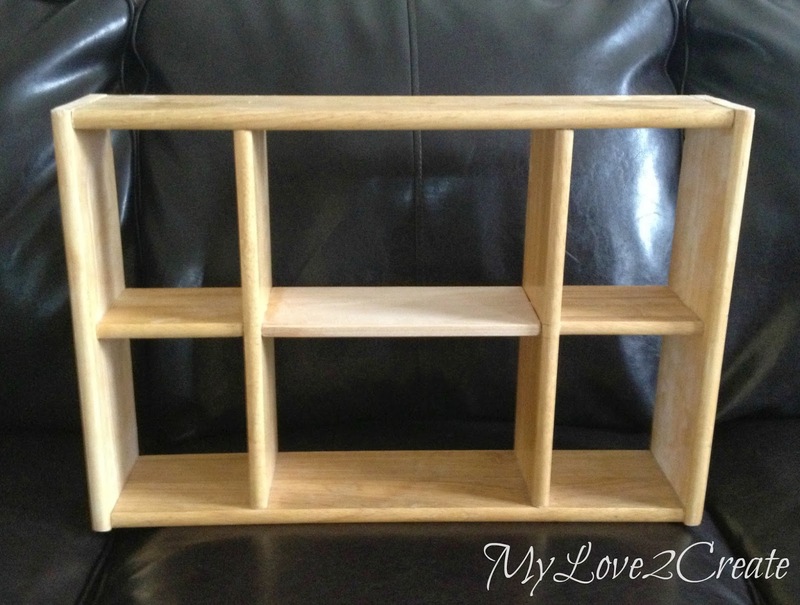 Love when you can redo and remake something and you sure did a great job on this shelf. You have also done a great tutorial to help others with this project. Thank you for sharing with the Clever Chicks Blog Hop! I hope you’ll join us again next week! Great project Mindi! It really looks like metal. And the numbers are really cool too! Wow Mindi, impressed the heck out of me! I love everything about this makeover - talk about talent. I'm visiting from the Work It Wednesday Party and so glad I clicked your link. 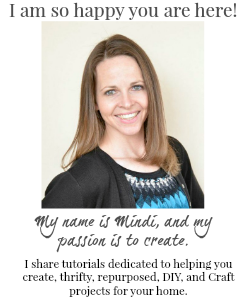 Oh my goodness, Mindi, this is unbelievable! Pinning! Make me one, make me one! But you should keep making those and sell them! Brillant idea and great job. Definitely going to find you on HomeTalk ! 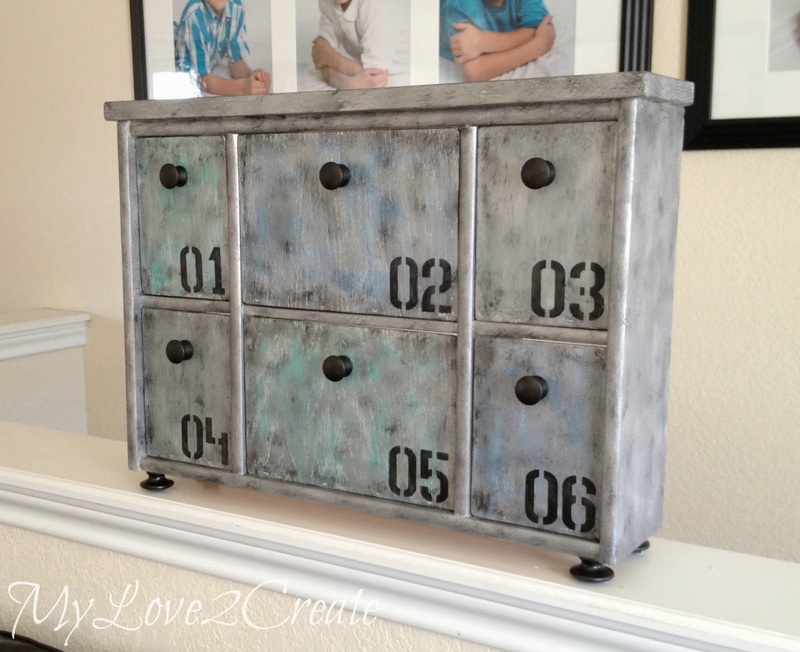 Happy Kids if they get to store their treasures in your numbered drawers. Pinned. Love it. Wow, I never saw that transformation coming, you are so creative! Thanks for sharing at The Makers! So sorry to hear about Buck. We have had our share of pets die and it is always so heartbreaking. Keeping you kids in my prayers for healing. Thank you for sharing at What We Accomplished Wednesdays. I am so impressed! You did a fantastic job on this- I love how it turned out! WOW this is gorgeous! Featuring later today, thanks for linking up! Whoa! 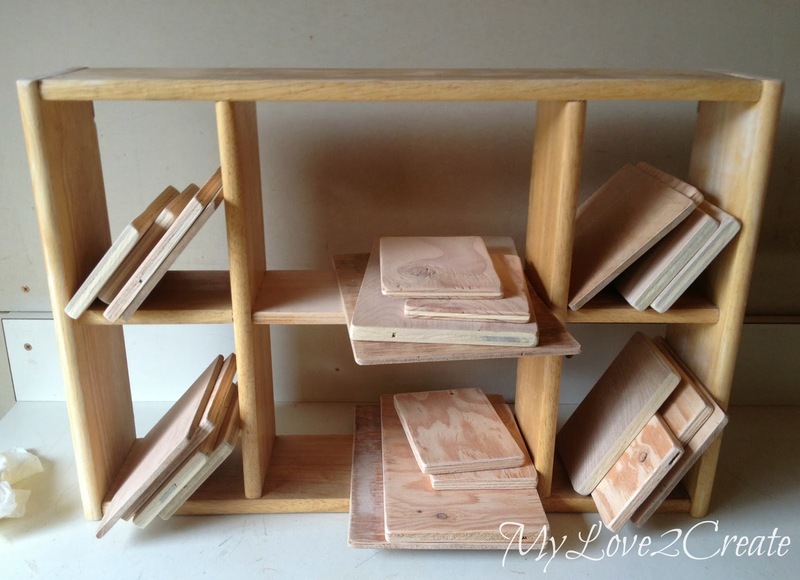 I had no idea you started with a wooden shelf! Great step by step tutorial too! Really cute!!! Love the paint treatment! Your vision's are amazing. Really.